If you've ever wanted to play a Mass Effect game with a buddy, it looks like you might be in luck. 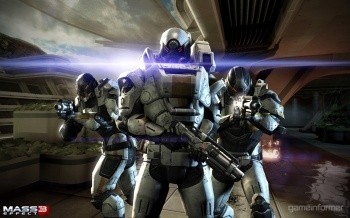 Australian gaming magazine PC PowerPlay has seemingly confirmed the long-rumored multiplayer mode in Mass Effect 3. The upcoming issue of the magazine apparently features a hands-on preview of the new modes and an interview with series producer Casey Hudson. Obviously, the magazine doesn't go into a whole lot of details - they want people to buy the issue, after all. The front of the magazine proclaims that players will be able to fight alongside their friends, but depending on what rumor you listen to, that could mean either co-op in the main game, or a series of side missions that run parallel to the main story. It sounds like this report is a little more substantial than the multiplayer "news" that appeared in Xbox World magazine. Sadly, it's going to make a lot of people unhappy, as multiplayer modes tacked on to previously-single player series often do. Hopefully, it's not going to intrude on the main game too much, but it's a little worrying to see EA and BioWare make Mass Effect something that it has never been before in order to pull in a wider audience. We'll undoubtedly find out more information when the magazine actually comes out. Mass Effect 3 itself comes out for PC, PS3, and Xbox 360 on March 6th.